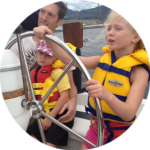 Climb aboard for the best sailing adventure on Lake Okanagan. Bring your own food and beverage, leave your cares back on shore and just go with the wind. 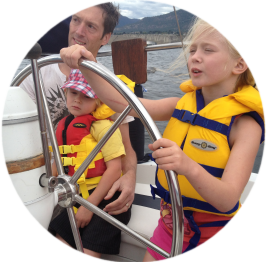 Sailing Okanagan is a “sail for charity” business donating 100 % of net profits to local charities so come and have fun and feel good about where your money is going. Sarita II a Hunter 29.5 sailboat and is moored in Penticton Marina at the south end of Okanagan Lake tucked in the east corner passed the Peach and the Casino. We’ll work with you to make your cruise a relaxing fun adventure. Prices; $30 per person per hour, 2 to 6 people, 2 to 6 hours, , min. 2 people 2 hours. It can include gourmet catered snacks, wine tasting, sightseeing, swimming, romantic sunset-sails, or take the wheel and play skipper! You just have to let us know what you want. Remarkably, this Okanagan Lake cruising region offers some of the best inland sailing in BC with excellent winds and clear blue skies. 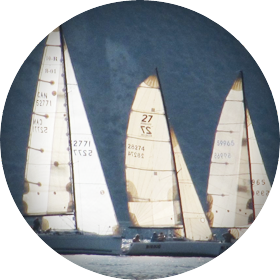 If you’ve done your wine tours why not enjoy your superb Okanagan wines on a sailboat enjoying a romantic sunset and have a great summer sailing adventure to talk about back home. To accommodate the weather and your personal comfort you should dress in layers which can be taken off or put on. Don’t forget your sunglasses and sunscreen. Sarita II is very seaworthy and comfortable with a large cockpit area. We customize all our cruises to accommodate the weather and your personal comfort; we will never willingly take you into bad weather. If the weather is too severe for a cruise and it needs to be canceled, your money paid are is refunded if it cannot be rescheduled. If for any reason Sarita II cannot be ready for the cruise due to unforeseen mechanical issues or illness of the Captain and Crew, all fees are refundable. Come sail with us – Sails Call is calling you!